Randwick City Council is responsible for determining the levels of lighting along streets and in parks. In most cases, the lights themselves are owned and maintained by Ausgrid. Contact us to make any enquiries regarding the level of lighting in the Randwick area. In most cases you can use Ausgrid's online maps to report a fault or outage. You can also call them on 1800 044 808 to report a faulty street light or park light. If the faulty light does not appear on the Ausgrid map, it may be a light maintained by Council. To report a fault on a Council owned light, please report the issue to Council. 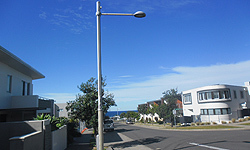 The lighting within the Prince Henry Development in Little Bay is an example of Council owned street lighting. See image below.